What is and Why Choose Modular Walls and Fencing? Everlast Services loves Modular Walls. They tick a lot of the boxes we’re looking for when it comes to fencing solutions. They’re becoming incredibly popular as more and more people realise just how useful they are, particularly when it comes to securing your home and making it look oh so stylish in the process. 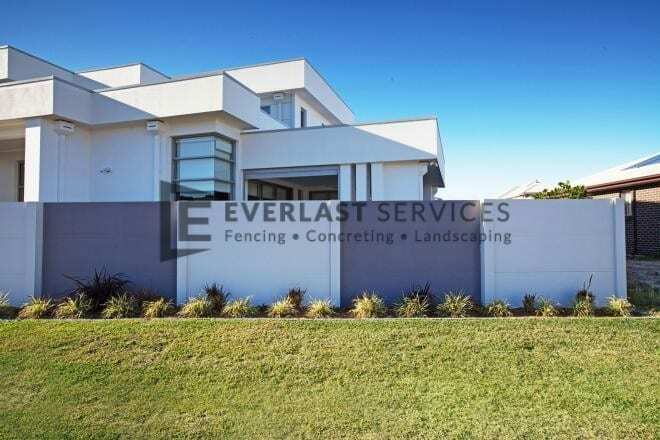 We’ve become a leading installer of this type of fencing in the Melbourne area, so we’ve had to become experts. In light of all this knowledge, we’ve decided to create an ultimate guide to one of our favourite materials. Modular fencing is comprised of an EPS core that is encased in a layer of fibre-reinforced cementitious sheets. These materials come together to create an impact resistant, lightweight, design-piece that offers all the incredible benefits listed below. The first reason is the incredible privacy and noise-blocking abilities that these walls offer. If you live in a built-up area or near a busy road, you need modular fencing. You can block your home off from prying eyes and enjoy the TV without having to turn it up every time an obnoxious Harley rider or Lamborghini driver comes past. You’ll also be able to keep your kids and pets safe. Modular fencing is very hard to climb so you won’t have to worry about any escapes or break-ins. In fact, you can get walls up 3000mm high to turn your home into a veritable fortress. The Aesthetics: Modular fencing looks incredible. It suits almost any aesthetic and makes the perfect canvas for you to attach other designs like wall art. Cheap: If you want a masonry or brick look but don’t want to fork out for the material and labour costs, you need modular fencing. The base material is cheap, and it can be erected quickly, so you’ll save a ton when it comes to manpower. Durability: The panel technology that forms Modular Fencing is lightweight but incredibly strong. It is resistant to warping, rotting and corrosion. It is also rigid and therefore safe against any exterior attacks or force. Low-Maintenance: This is an essential for the modern homeowner. Once the fencing has been erected, you don’t have to do a thing except hose it down every now and then. There’s no need to worry about painting or replacing any cracked or broken pieces, just enjoy the beautiful work of your contractors for years to come. Retention Capabilities: The rigidity and strength of modular solutions make them perfect for retaining walls and will even help to hold soil in place around your exterior fencing. Pool Fencing: Yes, modular fencing makes the perfect way to protect your pool and hold up your legal obligations. You can mix it with glass fencing to create an incredible design piece, and you won’t have to worry about rust or any other forms of degradation. Garden Screens: Use these to divide up your garden and create different sections. You can also hold soil in space and create different micro-environments so one area can be filled with arid plants and others can be filled with more temperate varieties, like ferns. Retaining Wall: Most gardens need a retaining wall, and masonry, brick or rendered options are all relatively expensive. You can achieve a similar aesthetic and save a lot of money by going with modular to keep your soil in place. Green Walls: Is your garden short on space? Don’t fear, you can still enjoy plenty of greenery. Just put up some modular walls and run creepers up them, or, turn them into vertical garden beds and plant herbs, flowers and anything else you can dream of. Privacy Screens: Your backyard should be an escape, and the best way to escape is to block out the world. It can be hard to sink into a book, sunbake or just let the kids loose out the back when you can feel eyes and ears everywhere. Luckily, the excellent sound and sight blocking qualities of modular walls make them perfect for turning your home into a time and space vacuum where nothing else exists but you and the people you love.